MINNEAPOLIS (AP) — The Minnesota Twins‘ blueprint for 2018 included a dynamic young center fielder making great plays on defense and coming up with big hits. Of course, that role was supposed to be filled by Byron Buxton, once considered the top prospect in baseball. Instead, the Twins are rallying around Jake Cave. Cave hit his first career grand slam and closer Fernando Rodney survived a chaotic ninth inning as the Minnesota Twins beat the Kansas City Royals 6-5 on Sunday. Buxton’s 2018 has been mostly a washout due to injuries. The No. 2 overall pick in the 2012 draft was optioned to Triple-A Rochester and is currently on the minor league disabled list with an injured wrist. That opened the door for Cave, a 25-year-old rookie the Twins acquired in a minor league trade with the Yankees this spring. Cave homered in his major league debut on May 19, and he established himself with a number of highlight-reel catches along the way, earning him the trust of manager Paul Molitor. The latest step in that process is came Sunday as Molitor started the left-handed hitting Cave against a hard-throwing lefty in Kansas City’s Danny Duffy (7-10), who had been tough on the Twins in three prior starts this season. That trust was rewarded with two outs in the second inning when Cave jumped on a full-count fastball for his first career grand slam and fourth homer of the season to put the Twins on top 4-2. Cave fell behind 1-2 in the at-bat and then laid off some tough pitches, including a curveball that just missed inside at 1-2 and a fastball just below the knees one pitch before the grand slam. Molitor likes what he’s seen so far from the Twins’ second choice in center field. Rodney came on to protect a one-run lead and promptly gave up Whit Merrifield’s fourth hit of the game leading off the ninth. But catcher Mitch Garver threw out Merrifield trying to steal second. Alex Gordon then struck out. Big sigh of relief, right? Hold that thought. Salvador Perez lined a single to center. Pinch runner Adalberto Mondesi stole second, then took third as Lucas Duda walked on a full-count pitch. Duda even stole second, his first stolen base since 2014. But with the tying run 90 feet away, Rodney retired Rosell Herrera on a ground ball to earn his 24th save in 30 chances. Twins starter Ervin Santana lasted just 4 1/3 innings in his third start since spending half of the season on the disabled list. Santana gave up three runs on seven hits and left after throwing 78 pitches. Lefty Gabriel Moya (2-0) got out of the two-on, one-out jam and earned his second career victory. He picked up career win No. 1 in Friday’s series opener. Royals: Mondesi got a second day off to rest his right shoulder, which he strained while diving for a ball on Friday. 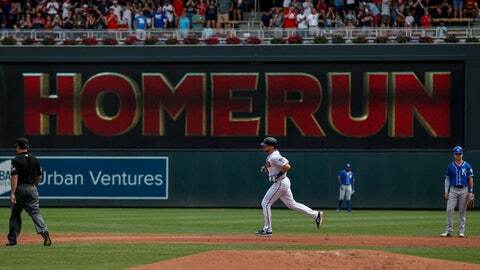 Twins: Grossman was replaced by a pinch runner after hitting a one-out single in the seventh. After initially listing him as day-to-day with a mild right hamstring strain, the team announced after the game that Grossman would be placed on the 10-day disabled list. Royals: RHP Jakob Junis (6-11, 5.12 ERA) takes the mound on Monday to open a three-game series against the Chicago Cubs in Kansas City. In his last start, Junis pitched into the sixth inning and struck out five White Sox to pick up his first victory since May 18. Twins: RHP Kyle Gibson (5-8, 3.47) will face the Indians for the second straight outing as the Twins open a three-game series in Cleveland on Monday. Gibson pitched six innings and allowed three earned runs while fanning six in a 6-2 loss to the Indians last Tuesday.